Since the turn of the Twentieth Century, a photograph of brownstone ruins in what is today Chambers Grove Park in Fond du Lac has been misidentified as being that of the ruins of the Astor Fur Post. It started with a lithographic postcard made with a photo of the ruins. The postcard has fooled historians through the ages. Not only is the photo misidentified, but the caption has some misinformation as well. The fur post at Fond du Lac was first established in 1808 by John Jacob Astor for his American Fur Company. After the War of 1812 forced the British out of the fur trade, Astor fortified the post with a fort in 1816. He did not obtain the fort from the British North West Company. The NWC ran their head of the lakes operation out of what is now Superior, Wisconsin, in a fort on Conner’s Point. That fort burned in 1800. While Astor did take over the NWC’s fur interests in the region, it did not take their fur post. The photograph’s misidentification in Van Brundt’s book may have led another historian to make the same mistake years later. Renown Iron range historian Marvin G. Lamppa’s 2004 Minnesota Iron Country—a truly wonderful history of Minnesota’s iron country—also misidentifies the brownstone ruins as those of Astor’s fur post. The ruins are actually the former home of Michael and Emily Chambers, built with brownstone quarried at Chambers’ brownstone quarry. Brownstone wasn’t quarried at Fond du Lac until 1856; the fur post was built with wooden logs. 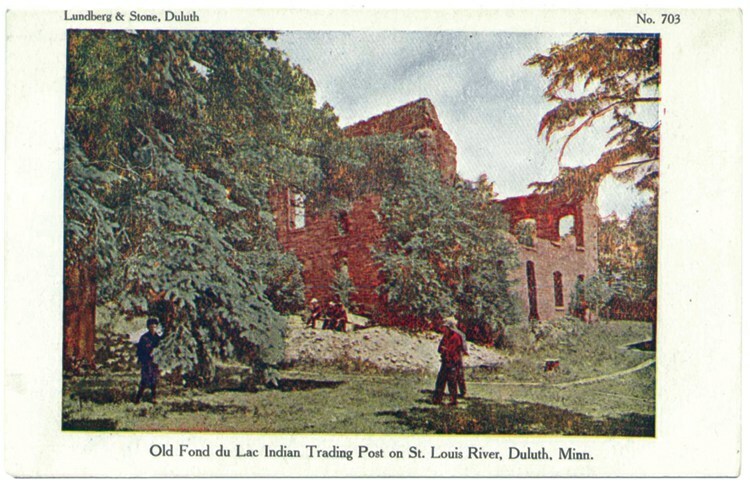 The fur post’s ruins, actually located further down the St. Louis River at what is today Historical Park (formerly Astor Park), lasted until 1915. The fort was recreated in the 1930s by the Works Projects Administration and, after falling into neglect and disrepair, was destroyed some time between 1966 and 1968. The Chambers house was destroyed in an arson fire in 1891. The mansion was never rebuilt. Michael Chambers died in 1895, but the ruins of his home were not removed until 1912. Before Emily Chambers’ death in 1926, the City of Duluth purchased 577 acres from her. Ten of those acres east of the quarry and the home site were developed into Duluth’s Chambers Grove Park.